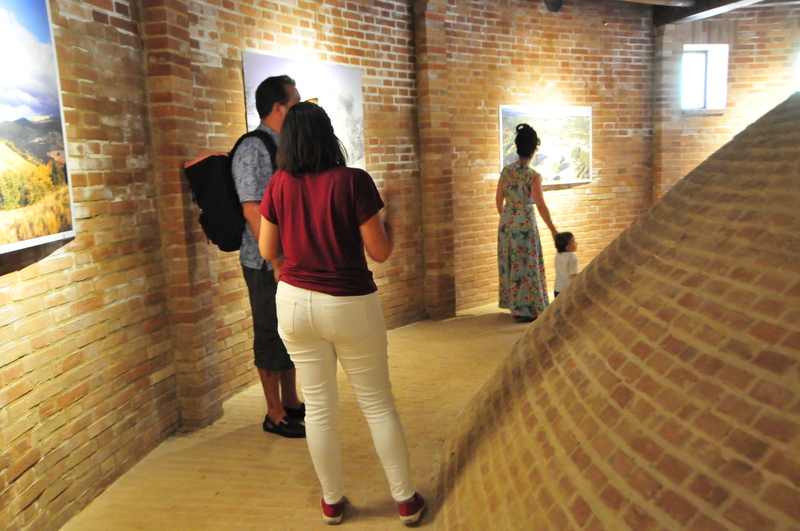 At Siena House we excel at helping you tour and taste Tuscan wine – like a local. Whilst often we recommend adding our favourite wineries in to you day; mixing one winery with lunch in a gorgeous unspoilt hill town and a good scenic drive (tasting ‘sip and spit’, staying legal and bringing the wine back to enjoy at the house) we can also drive you if you prefer. Our rates for driving are competitive at Euro 40 per hour (Range Rover Vogue) with the benefit that you don’t have to book or commit to anything way in advance if you are staying at the house. 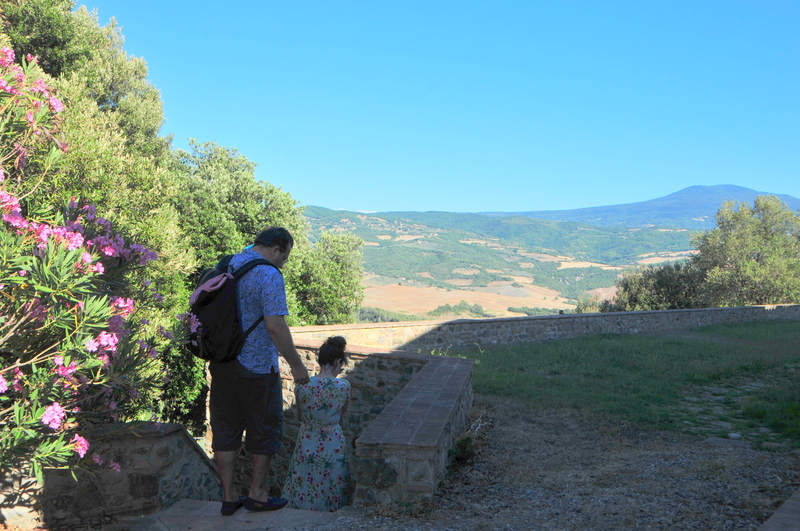 This is the story of a visit to one of our favourite Tuscan wineries to give you a taste of wine tasting in Tuscany. 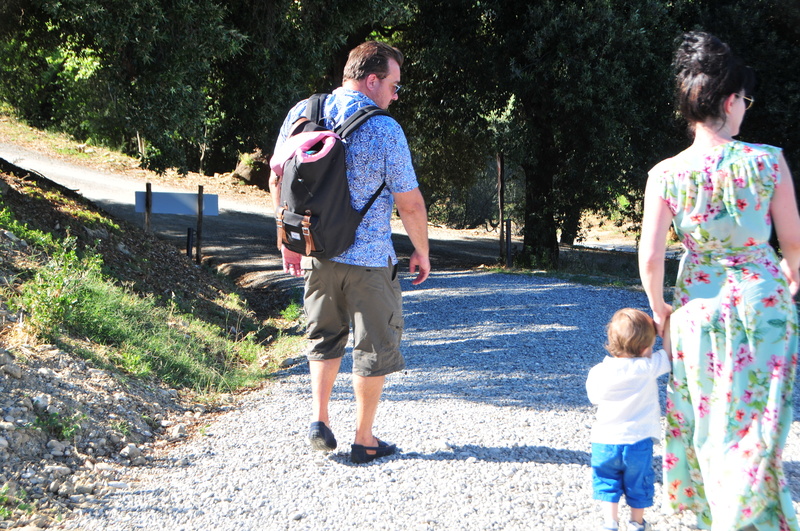 On a hot hot July afternoon I accompanied Chris and Kyla (and their little son Truman) to a Tuscan vineyard for some wine tasting. 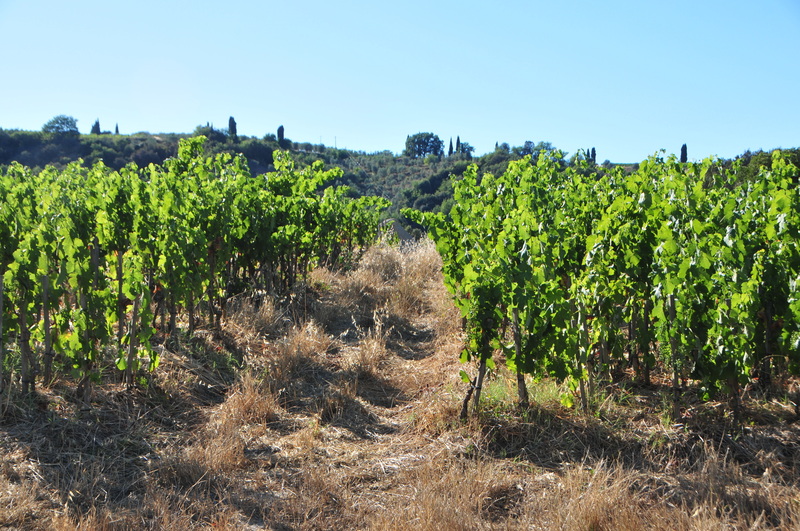 We chose Podere Le Ripi, a boutique biodynamic winery at Castelnuovo dell’Abate, in Montalcino. 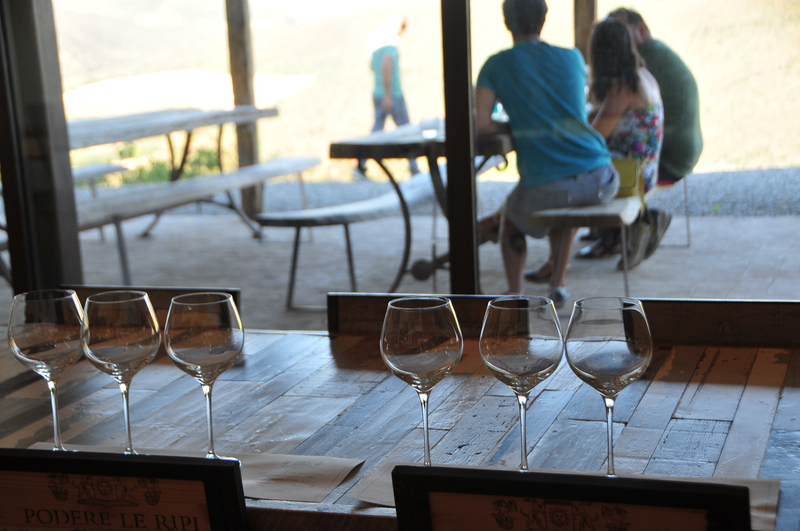 This winery has been a big hit with our guests, we love their wine and are big big fans ! Podere Le Ripi is the personal project of Francesco Illy (of Illy Coffee fame). Incredibly, despite having booked many a tour and tasting for our guests, I had never actually visited this vineyard, Malvin usually went. The journey was scenic and we had time to talk about wine on the way, whilst enjoying the views. Most of the journey was easy, but the ‘white road’ ascent for the final few km is narrow, steep and winding. No problem with the Range Rover! …entering exiting you are always at ‘ground level’. Chris and Kyla’s little boy, who is not long walking enjoyed this curious, richly coloured spiral cavern. 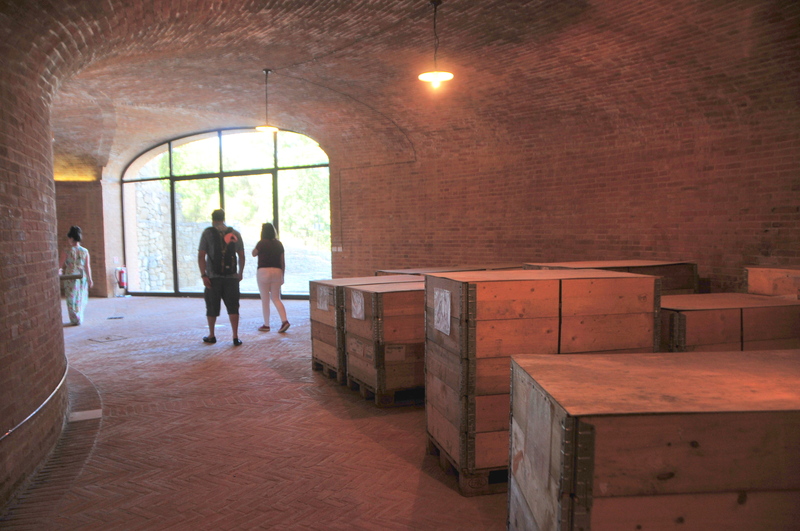 The cellar was beautifully cool, of course, that’s the idea. 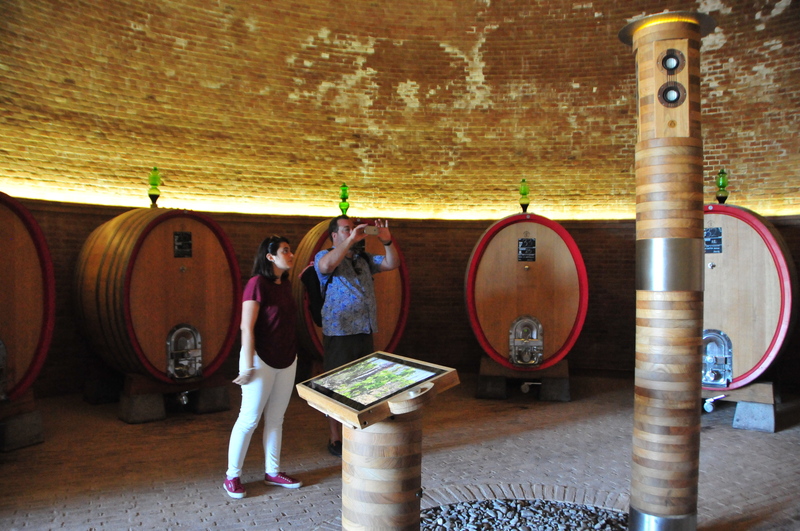 During the descent we passed various stages barrels and boxes, finally to the aging of the Brunello in Oak casks, resting in a circular hall where the atmosphere is very special; the wine is ‘listening’ to music. 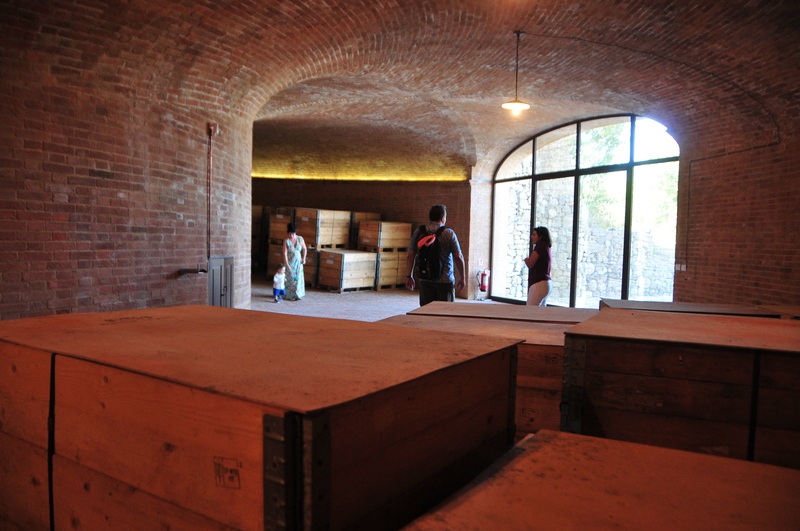 From the cool calm of the aging cellar, we stepped back outside into the blinding sun. It was tempting to head straight back up top to the cool of the tasting room but we had to see the innovative and unique Bonsai vineyard whilst we were here ! 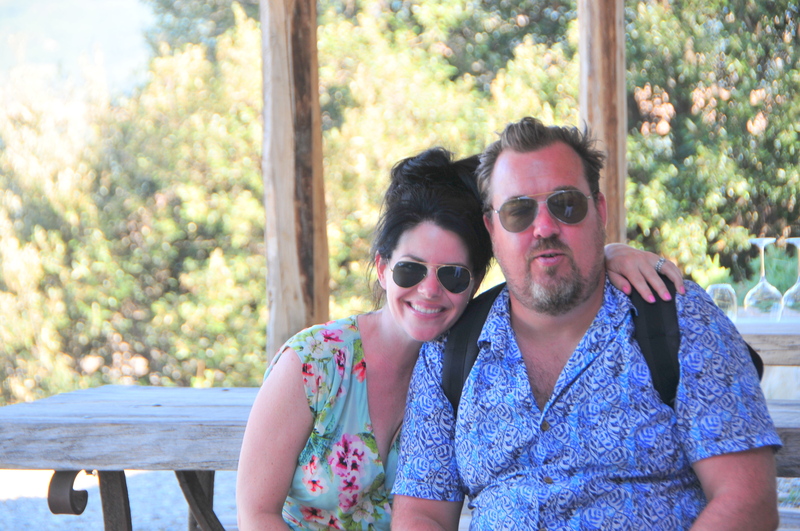 Tasting at the winery, I think Chris agreed! 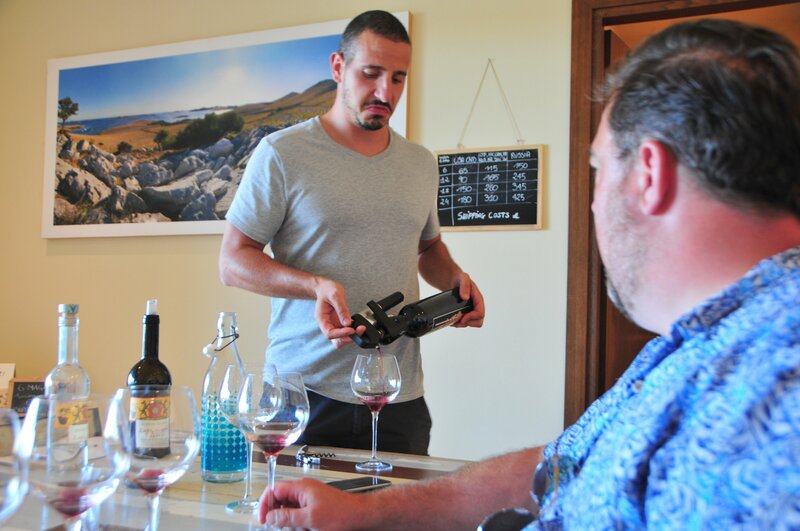 We were lucky that the winemaker, Sebastian Nasello, was present during our visit. There’s nothing like a tasting guided by the winemaker himself ! 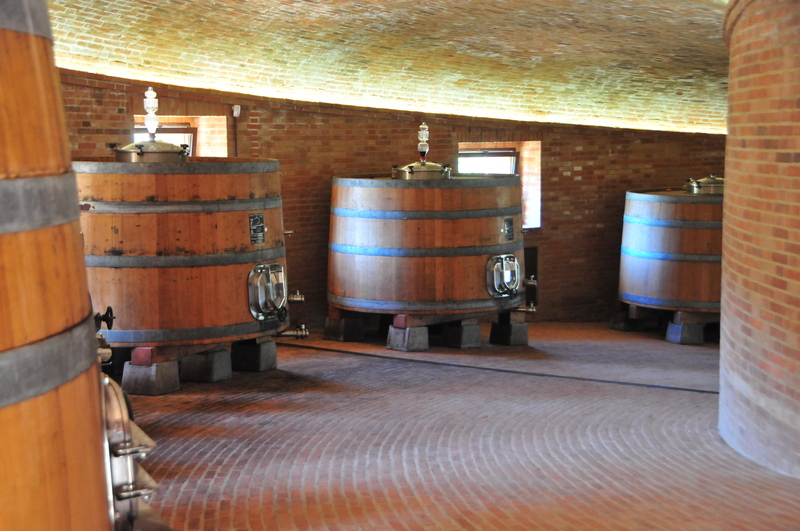 Podere Le Ripi is a relatively new winery, the property and views are beautiful. Staff are passionate and welcoming. We passed an idyllic couple of hours here. The experience is relaxed and personal and yet so professional; highest quality and highly recommended. It was impossible to resist buying a case to relive the Love and Magic back home ! Update: Love and Magic 2014 (late release Rosso di Montalcino) presented at Benvenuto Brunello, Montalcino in Feb 2018. (link to post talking about the event featuring a guided tasting of Love and Magic 2014 with the winemaker, Sebastian Nasello) Despite 2014 being in general not a great year for wines this particular example is outstanding – and Love and Magic 2014 is already sold out by July 2018. 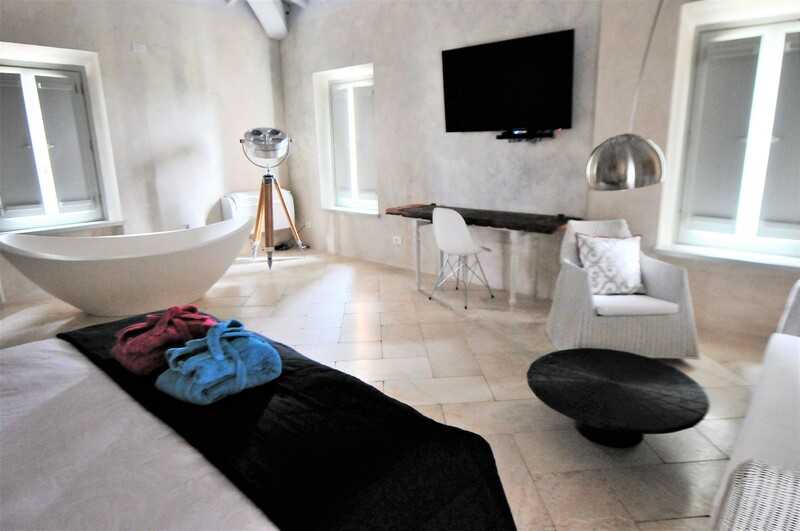 Siena House is the Tuscan home of a Wall Street trader (Malvin) and an Artist (Amanda) It’s a real luxury home with gorgeous rooms and views in a hub location for wines, hill towns and scenic routes. We offer both Villa and B&B type accommodation for both long and short stays. Search availability or contact us HERE. 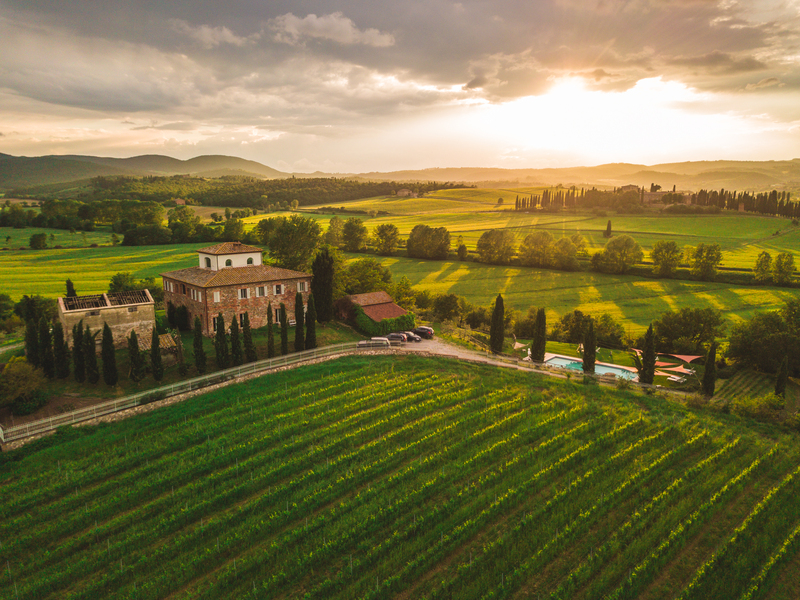 We speak English and our concierge service begins way before you book… so you should never hesitate to get in touch if you are planning a luxurious stay in Tuscany and would like to know more! Also loved my experience with Montalcino wines, and the Brunelo’s but I must also say that I experienced fabulous Brunelo grappas and brought one bottle home to enjoy. Thanks for this story it brings back good memories. That’s exactly the beauty of tasting in the vineyard; reliving the experience alongside the aroma and flavour and memories evoked with every sip… the quality seems to get better every year and of course every year and vintage is a little different from the next, we have reached the point where we relive details of the year on the label based on the climate and what it brings out in the wine !